Work on the development of a new basic trainer for the Brazilian air force began in January 1978, the product of a design team led by Ing. Joseph Kovacs. A contract for two prototypes and two static test airframes was awarded to the company by the Brazilian Ministry of Aeronautics on 6 December 1978. 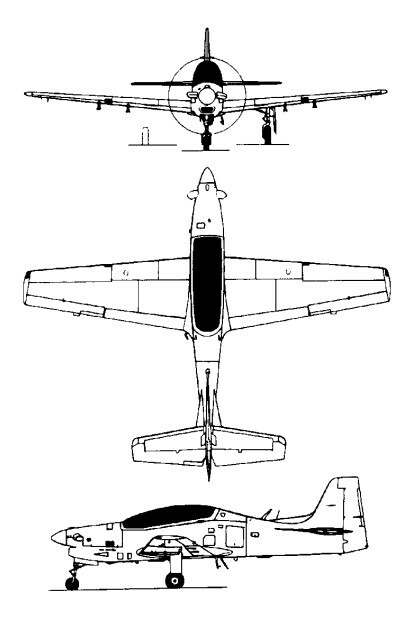 Given the company designation EMBRAER EMB-312 and known to the Brazilian air force as the T-27, the type was named Tucano (Toucan) on 23 October 1981. A conventional-looking cantilever low-wing monoplane of light alloy construction, the EMB-312 has retractable tricycle landing gear, enclosed cabin accommodation for two in tandem seated on Martin-Baker ejection seats, and power provided by a Pratt & Whitney Aircraft of Canada PT6A turboprop engine. The prototype flew for the first time on 16 August 1980 followed by a second on 10 December. A third, built to full production standards, flew in August 1982 and initial deliveries to the Brazilian air force were made in September 1983. Ordered by the FAB to replace the Cessna T-37, the type has since found world acceptance and by the middle of 1991 over 350 had been delivered out of 376 firmly ordered, with a further 86 on option. Tucano customers are the Brazilian air force (128), Honduras (12), Egypt (54), Iraq (80), Venezuela (31), Peru (20), Argentina (30), Paraguay (6) and Iran (15). Argentina received its first five aircraft, from an order for 30, on May 21, 1987. Peru took delivery of its first EMB.312 in April 1987, and in the same month Venezuela received its 30th and last Tucano. The Brazilian Air Force’s 118th aircraft was deliv-ered in May 1986, and by June 1987 281 had been delivered to eight customers. Egypt is licence-building the Tucano, both for its own use and for Iraq. Embraer supplied ten complete aircraft at the end of 1984, and by April 1987 had delivered the 100th CKD kit to the Arab Organisation for Industrialisation’s Kader Factory. The combined Egyptian/Iraqi order was for 120 Tucanos, plus options. An uprated version was ordered by the UK government in March 1985 to replace Jet Provosts in the Royai Air Force and 130 were in production as the Shorts Tucano T.Mk 1, with 15 more on option. The extensively developed version features a strengthened airframe and significantly enhanced performance powewed by an 820kW Garrett TPE331-12B engine, and has itself attracted orders from Kenya (12) and Kuwait (16). The first Garrett powered aircraft flew in Brazil on February 14, 1986. The first Shorts-built Tucano flew in December 1986, deliveries to the RAF began in June 1987, and about 60 had been built and delivered by mid-1991. Although superficially similar to the original Brazilian-designed aircraft the Shorts Tucano is considerably different to meet the Service's requirements. The original PT6A has been replaced by 1,100 shp (820 kW) Garrett TPE331-12B turboprop, a ventral airbrake added, a new cockpit layout provided and the structure strengthened for a fatigue life of 12,000 hours. Four underwing hardpoints can be fitted for export customers. The Embraer EMB 314 Super Tucano Brazilian turboprop aircraft designed for light attack & counter insurgency first flew on 2 June 1999. Tucano T.Mk 1: basic trainer version developed and built by Short Brothers in Belfast, in collaboration with EMBRAER. One-hundred-and-thirty, each powered by a Garrett TPE331-12B engine driving a Hartzell four-bladed propeller, ordered for RAF. Tucano T.Mk 51: Twelve Shorts-built armed aircraft ordered by Kenyan air force in 1988 for weapons training. First example flown in October 1989 and delivered in 1990. Tucano T.Mk 52: Sixteen Shorts-built basic trainers ordered by Kuwait air force in February 1989 for delivery in 1991.